A rooster screams and the scent of combusting wood greets the nose as I focus on my pedal stroke – steady in the scorching midday heat. As we stop to refuel with a coconut, my riding partner and I take note of the kitchen set up in the corner of a simple palm-thatched structure. Appliances are absent and instead replaced with the bare necessities; a table, cutting board and a smoldering ceramic stove reminiscent of a bucket. Since leaving Korea, the next adventure has begun. Along with a close friend from home, I have set out on a journey through the countryside of Cambodia and beyond via bicycle. As each passing village greets us to a chorus of “hello!”, we make our way to the project site of Kampong Chhnang. Here, about 80 km northwest of Phnom Penh, we will be partnering with the NGO GERES Cambodia in an exploration of their Improved Cook Stoves (ICS) initiative. A part of the Group for the Environment, Renewable Energy and Solidarity (GERES) based in France, GERES started their work here in 1994. Taking note of the rampant deforestation, GERES set out to assist Cambodians in protecting their precious natural resources by decreasing the community demand. A portion of the stress placed on the forests of this region is due to the high demand for fuel wood, used directly or manufactured into charcoal for cooking. To lessen this stress, GERES looked first at the traditional methods in action. Finding a high percentage of the population cooking on basic stoves or open fires, the organization set out to incorporate some modifications into the stove design with the hopes of improving efficiency. Wanting to take an integrated approach, they partnered with local stove producers to provide insight and training so that these same individuals could retain ownership of the domestic industry and ensure the project’s longevity. Today, GERES oversees the production of two different models of improved cook stoves by providing quality control and technical support. Together with the stalwart cooperative of stove producers and distributors, they have contributed to the sale of over 2 million units, making up nearly 40% of the market share and saving nearly 1.2 million tons of natural resources. After working on a similar project in Honduras with the organization Trees, Water and People, I have seen the overwhelming impact of clean cooking. Besides the implications on lessening one’s carbon-footprint and preserving forests, the benefits strike close to home when a financially burdened family spends a little less each month on fuel and a little more each month on rice. Not to mention the role these improved stoves play in helping to eliminate Indoor Air Pollution (IAP), a common culprit in the deaths of women and children who are subjected to the constant inhalation of indoor cook smoke. In this next chapter, join Thai Curry in Korea as it ventures abroad to explore clean cooking in action. Using food as a common denominator, my riding partner and I will be visiting families with these improved cook stoves to learn and share the foundations of Cambodian (Khmer) cooking. 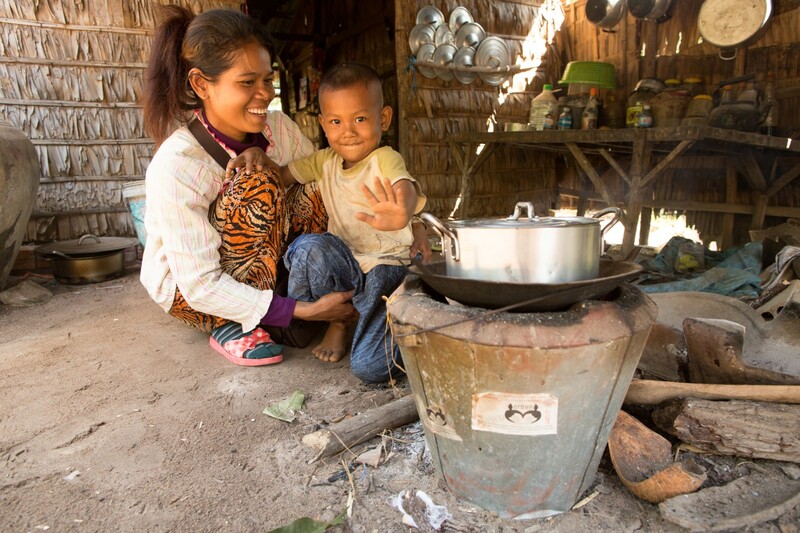 After assisting in the preparation of traditional foods, stay tuned for the culmination of this project: a fusion meal prepared and shared with a Cambodian family on a fuel-efficient stove. Come along as we help you to warm your hearth with Cambodian flavors and bring the tropics home.